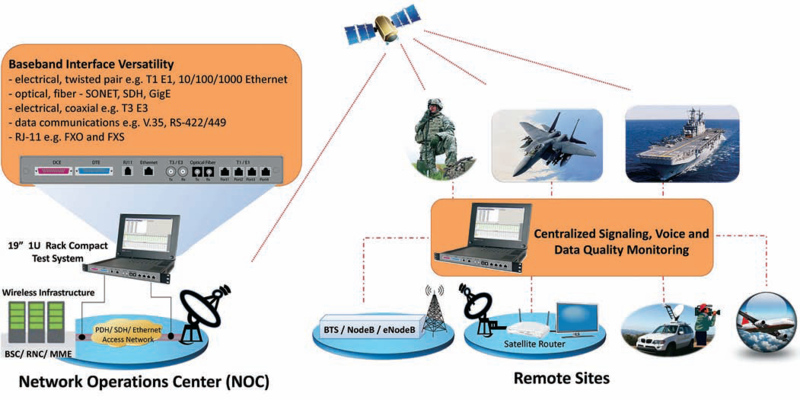 To ensure performance and reliability, operators must have the ability to remotely monitor, maintain, and intrusively test satellite circuits and networks. 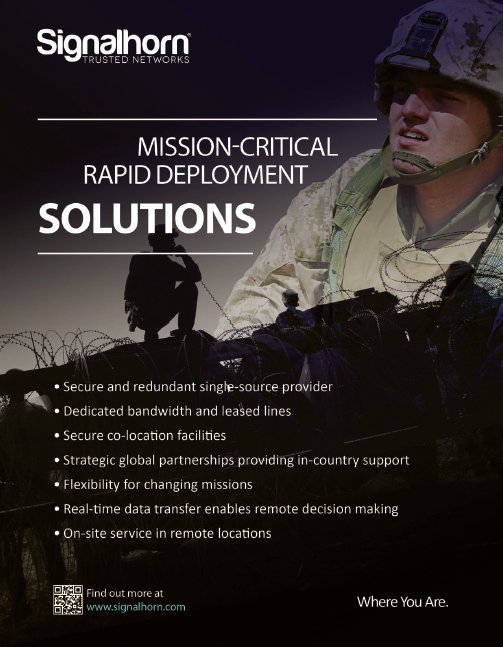 To ensure performance and reliability, these operators must have the ability to remotely monitor, maintain, and intrusively test satellite circuits and networks. A single compact platform with all-interface flexibility, support for wide data rates from a single voice channel to Gigabit pipes, and broad protocol emulation and analysis capability would be ideal. Current conventional test equipment available in the market requires additional multiplexing / de-multiplexing equipment with substantial cabling that invariably results in a bulky solution. This is especially the case with broadband rates. 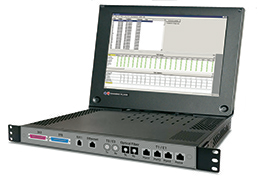 GL’s test platform, properly packaged with plug-in interfaces and features, comes close to meeting the challenge with a single, portable, configurable solution. 1. RJ-11 with FXO, FXS, 4-wire, PTT—for one to many voice or fax channels - many military communications systems require instant secure intelligible voice communications whether in a remote mountainous location or on a moving transport vehicle. Fax is also a necessity. Sometimes, fax is demodulated before satellite transmission and then remodulated at the distant end. The device under test could be a military radio, IP radio, modem, router, gateway, etc. Usually the interface is analog audio. Test and measurement capability involves QoS metrics - voice intelligibility, quality, connection time, efficiency, and reliability. 2. Data Communications Interfaces—voice, video, and data may be available through datacom (serial) interfaces such as V.35, RS-232, RS-422/449, RS-485, or special baseband coding (e.g. Manchester, inverted Manchester, NRZI, Manchester Differential, Bi-Phase (Manchester FM-0, Manchester FM-1). These interfaces usually use Layer 2 protocols - supporting Frame Relay, HDLC, PPP, ATM, Async, and others. Encryption may be a part of the system through the use of IP or serial crypto devices. 3. Ethernet / IP—10/100/1000 Mbps is ubiquitous for both management and traffic. Internet Protocol is dominant across this interface and can handle voice, video, and data at variable rates (consequently it is replacing TDM more and more). However the myriad of protocols, routing, and security pose special concerns. Testing at all layers (MAC, IP, UDP, TCP, and higher) is a definite requirement. 2G, 2.5G, 3G, and 4G are all migrating to IP from T1 E1. Satellite backhaul from BTS (2G) via Abis, Node B (3G) via IuB, and eNodeB (4G) via S1 to their corresponding BSC (2G), RNC (3G), and MME (4G) is common for sparse demographics. Even for metro architectures, backhaul via fiber is common for efficiency reasons. 4. T1 E1 and Fractional T1 E1—are common interfaces in the telecom world and, likewise, in satellite circuits and networks. In military applications, T1 E1 tend to be used in “unchannelized” and perhaps even “unframed” modes. Unchannelized is simply the aggregation of multiple timeslots (one or all) into one hyperchannel. Unframed mode uses the framing bits (8 kbps in T1, 64 kbps in E1) for traffic. 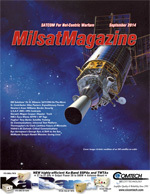 Since satellite capacity is generally expensive and lower in bandwidth than terrestrial, TDM with compression and/or packetization with compression techniques are frequently used to improve efficiency. 5. T3 E3 STS-1 HSSI—broadband satellite applications are becoming more common such as imaging, video conferencing, streaming video (MPEG-3), and Web. Point--to-point and point-to-multipoint applications are common, for example, TDMA uplink and TDM downlink for a community of terminals that access a central gateway. 6. OC-3 / STM-1 / OC-12 / STM-4—Over all satellite, these rates have several applications: IP video, unchannelized PPP with IP, and mobile network backhaul. Backhaul over satellite is popular for all mobile network technologies - 2G, 3G, and 4G (LTE), since voice is transported in compressed form resulting in capacity gains of 4x to 6x. For example, at a dense BTS site with over 10,000 voice channels (AMR narrowband -compressed speech), can be backhauled with a single STM-1 pipe to the BSC site. There it may be uncompressed to PCM (ulaw or Alaw) prior to forwarding to the PSTN. Protocol Emulation & Analysis—is another aspect of a successful test platform. 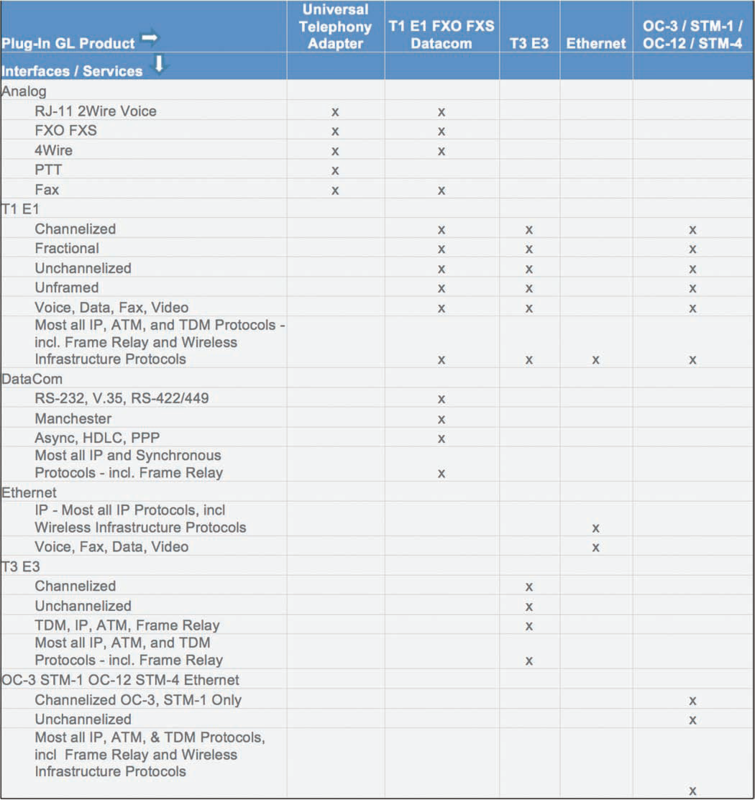 The GL Product Configuration table shows how the interfaces and rates can be plugged-in to a 19” chassis to accommodate required features. A fully configured test system may contain all or some of the identified GL products mentioned below—this provides interfaces from analog to OC-12 / STM-4 in a very compact system (show below). • IP - SIP, SIP-I, SIP-T, Skinny, H.323, Megaco, MGCP, RTP, RTCP, T.38, H.264, Diameter, Radius, SIGTRAN, GSMoIP, UMTSoIP (including IuCS, IuH, IuPS), LTE (including S1, eGTP, X2AP), GPRS, SGSN and GGSN. • Codecs - uLaw, ALaw, G.722, G.722.1, G.722.2, G.729 (including A/B), Speex, AMR (including NB/WB), iLBC, EVRC, EVRC-B, EVRC-C, GSM (FR, EFR, HR), and G.726. Of particular note, is the provision of channelized and unchannelized access for T3 E3 and OC-3 STM-1. This feature provides access to all DS0s or sub channels within T1s and E1s in the OC-3 and STM-1; similarly for T3 E3. The channelization feature saves enormous space, power, and cabling. Being able to assess content deep within a multiplexed stream provides improved visibility into dense transmission signals. Unlike the old days, when mobile services were restricted by regulation and technology, the landscape has now changed dramatically with less regulation; technology is meeting the demand for information anywhere anytime. Satellite technology with its inherent advantage of connectivity is also keeping pace. The demand for broadband IP is also not stationary—it pervades business and personal aspects. Voice, email, Internet, video, image services are in demand whether on a plane or in a car. 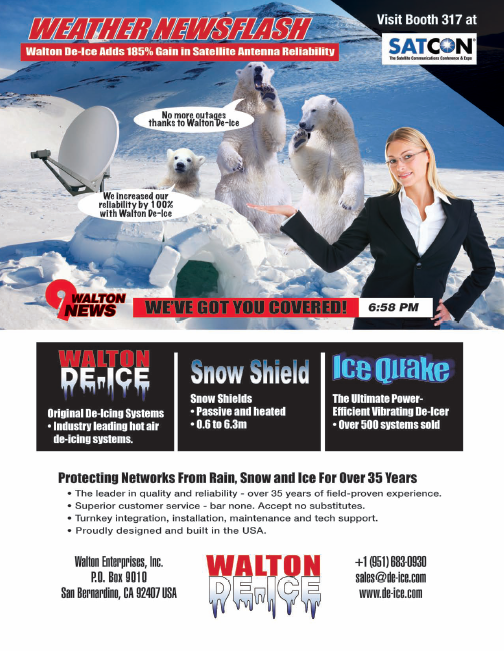 Carriers such as Inmarsat and ViaSat offer these services very competitively. Satellites are no longer relegated to geosynchronous orbit; LEOs, MEOs, and spotbeams are revolutionizing the space. Portable test equipment that addresses this new market with a broad set of configurable interfaces, data rates, and IP and legacy protocol suites can be very valuable for diagnostics and maintenance. One such possibility has been discussed in this article.